Disclaimer: This is for public information only and does not constitute or imply endorsement, recommendation, or favoring by Marine Discovery Center. On the 2018 general election ballot this November 6th, voters in New Smyrna Beach will be asked to vote on whether to give the City Commission authority to issue up to $15 million in general obligation bonds to protect natural areas and wildlife habitat from development by acquiring land along the Turnbull Creek watershed. Turnbull Creek was selected for its environmental sensitivity as a critical waypoint for waters flowing north into Turnbull Bay, Spruce Creek, the Indian River, and Atlantic Ocean and its historical significance as “Andrew Turnbull’s Grand Canal” during our area’s British colonial period. Any land acquired, including those portions of land currently zoned for development, would instead be set aside and protected in its natural state. The City has scheduled guided walking tours to show voters some of the proposed preservation sites up close. These tours will be free and open to the public, with no advance registration required. City staff will be in attendance along with speakers from the Marine Discovery Center, New Smyrna Beach Museum of History, and other institutions to provide you with details about local waterways, plants, and wildlife along Turnbull Creek and offer insights into how it came to be listed on the National Register of Historic Places. Tours will start and finish at the picnic pavilion of Holland Park (357 Otter Blvd). 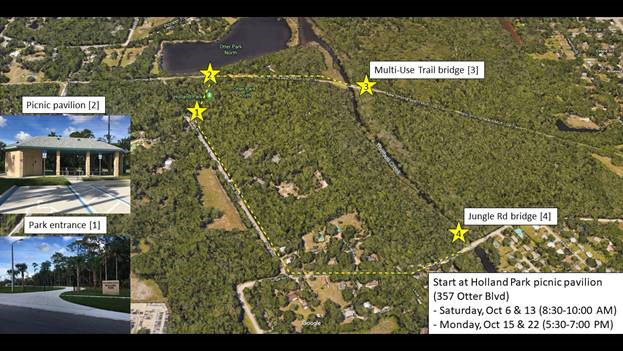 Tours will first proceed east along the New Smyrna Beach multi-use trail to a bridge which passes over Turnbull Creek (0.25 miles). After each speaker has presented, the group will return to Holland Park where you will have the option to conclude the tour or continue down Otter Boulevard to a bridge on Jungle Road for another peek at Turnbull Creek (0.75 miles). Would you like to know more? Please visit www.cityofnsb.com/gob for more information and see below for the official language you can expect to see on your general election ballot. To protect water quality by preventing pollution in Turnbull Creek and Bay, Spruce Creek, the Indian River, and the Atlantic Ocean and preserve wildlife habitat and natural areas from development by acquiring land along Turnbull Creek, shall the City of New Smyrna Beach issue general obligation bonds at rates not exceeding the maximum legal rate, maturing within 30 years, not exceeding $15 million payable from ad valorem taxes with full public disclosure of all spending?